Includes Fashion Tips And Tasty Recipes! Mary: When I was six years old I wrote some short stories and they were published in my elementary school newspaper. They were all about little animals who were naughty and then realized they should be good. I always wanted to write and have kept on ever since. Mary: I loved the Nancy Drew books, and Sherlock Holmes mysteries, Dr. Doolittle. I gobbled up every book I could find. I used to read under the covers at night when I was supposed to be asleep. Mary: I write for three or four hours in the morning when I'm fresh, after breakfast and sticking the dishes in the dishwasher. I don't really have any quirks. I'm just grateful for computers because they are so much easier than typewriters. Mary: That I could create Paris again. I studied there for a year after I graduated from college and lived with a French family. It was one of the best years of my life. I wanted to make it come alive again and went back there to be sure I brought it up to date. I was surprised to find that all the main things I loved about Paris were still true – its beauty, its walkability, its language, the food, the people. They were all still great. Mary: I love P.D.James, Virginia Woolf, F. Scott Fitzgerald, Kurt Vonnegut, George Orwell, Joan Didion. Mary: I'm finishing the fifth book in my Happy Hoofer cozy mystery series. It's called “High Kicks, Hot Chocolate and Homicide” and it takes place in New York City, my favorite place next to Paris. There is a Rafflecopter Giveaway for this tour for books and a great prize package from Kensington. Cancans, Croissants, and Caskets sounds like a very good read ... I've added it to my TBR list!! Mary, you are a new-to-me author. But I do think the synopsis of this book sounds like one I do want to read, so it has gone on my TBR list. Many years ago, while my hubby was stationed in The Netherlands, we took a 3 day tour to Paris. I still remember some of the scenes, and sounds. I'd love to be able to revisit Paris someday. 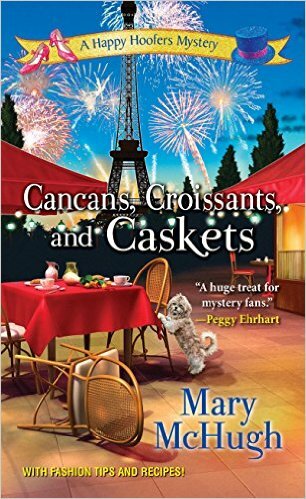 Cozy Mysteries are my absolute favorite - "Cancans, Croissants, and Caskets" looks like a must read!